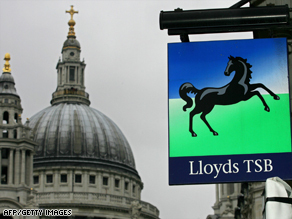 LONDON, England (CNN) -- The British government confirmed Saturday it will take majority control of Lloyds Banking Group, with the taxpayer owning up to 66 percent of voting shares in return for insuring £260 billion ($366 billion) of the group's toxic assets. The global economic slowdown is producing big losses in the British banking industry. The UK government already effectively controls two other major banks -- Northern Rock and Royal Bank of Scotland. The deal with the Treasury will see Lloyds commit to lend at least £28 billion ($40 billion) over the next two years, Treasury chief secretary Stephen Timms said. In return, the government will insure the bank's riskiest loans. As a result, its holding in the bank could increase from 43 percent to 66 percent of voting shares. Its fee for limiting Lloyds' losses from the bad assets is £15.6 billion ($22 billion). Under the scheme, the bank will take the first hit of up to £25 billion ($35 billion) on toxic assets before the taxpayer steps in. The agreement was a "major step" in restoring lending capacity in the UK, Timms said, adding that the deal would end the "uncertainty" about the value of Lloyds' assets. Timms said the negotiations were complex, but the result was in the best interests of shareholders. He rejected claims the government was slowly nationalizing the banking sector. "Our view is that banks are best in the commercial sector, best privately owned, that's the destination that we envisage for all the banks." Lloyds Banking Group was formed following the merger between HBOS and Lloyds TSB, a deal encouraged by the government, last year. It began trading for the first time in January. However, the acquisition of HBOS has proved a greater drag on Lloyds than previously expected. Nearly two weeks ago Lloyds announced HBOS made a £10.8 billion ($15.5 billion) pre-tax loss for 2008. Lloyds itself posted an 80 percent plunge in pre-tax profit to £807 million ($1.1 billion), which was in line with figures released in a trading update earlier this month. The bank said the 2008 results were the product of "difficult market conditions" marked by a significant decline in credit quality and the fall in the UK property market. Eric Daniels, Lloyds' chief executive, said on Saturday the deal with the government "substantially reduces the risk profile of the group's balance sheet." "Our significantly enhanced capital position will ensure that the group can weather the severest of economic downturns and emerge strongly when the economy recovers. We believe that this is an appropriate deal for our shareholders."